* Dinner Package* Includes a side salad, a non-alcoholic drink, any entree off the menu, a reserved seat in the front section, tax & gratuity. You probably remember John Witherspoon as Ice Cube''s (Craig''s) outrageously funny, dog-catching dad in New Line Cinema''s smash urban trilogy Friday, Next Friday & Friday After Next, or as "Pops" on the long-running syndicated sitcom "The Wayans Brothers" or as "Spoon" on NBC''s "The Tracy Morgan Show." One thing''s for sure, once you''ve seen Witherspoon you completely understand why he has earned the reputation as one of America''s funniest dads. Witherspoon has brought to life some of the most hilarious, unforgettable characters ever including, David Allen Grier''s fashionably challenged, mushroom-wearing father in the romantic comedy Boomerang, and the quirky, diner-owning father "Pops" on The WB''s "The Wayans Brothers." His scene-stealing roles in Boomerang, Little Nicky, House Party, Vampire in Brooklyn, and I''m Gonna Git You Sucka, made him one of the most memorable funny men in America. You''ve seen him in everything from popular music videos alongside Jay Z and Sugar Ray ---to sitcoms opposite "The Wayans Brothers" and "Saturday Night Live''s," Tracy Morgan ---to blockbuster movies alongside Eddie Murphy, Adam Sandler, Chris Tucker and Ice Cube, amongst others. Not only does Witherspoon''s work span over four decades to include blockbuster movies, hit-television shows, commercials, and top-rated music videos, but he''s coined his own catch phrases''as in "Bang!Bang!Bang!Bang!" and "You Gotta Co-ordinate!" You have to wonder how a comedian whose work can be traced back as far as "WKRP in Cincinnati" and "Barnaby Jones," can still be relevant today. His roles in the Friday series, (Friday, Next Friday, Friday After Next), Soul Plane, Ladies Man, Boomerang, Vampire in Brooklyn, Little Nicky, House Party, etc. are arguably some of the most hilarious bits of comedy to date. The Orange County Register describes the comedian/actor as being in a class of his own. "Witherspoon is one of those performers who doesn''t need a funny line to be funny. Just standing there in a truculent posture with a suspicious look, he is funny and enlivens every scene he''s in." The Detroit-bred comic has proven that he is a Hollywood mainstay and continues to land coveted spots in some of America''s favorite movies and television shows. Witherspoon will have America laughing once again this fall in his wickedly funny role in the highly anticipated animated series, "The Boondock''s" (The Cartoon Network). He stars as the eccentric "Grandad" in the series based on the award winning and politically charged comic strip. Additionally, Witherspoon has lent his voice to other top-rated animated shows including, "The Proud Family" and "Kim Possible," amongst others. 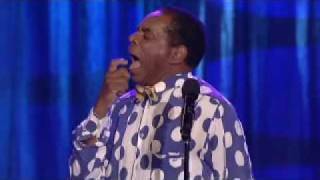 Witherspoon continues to tour around the country with his wildly popular stand-up show and recently launched The John Witherspoon Collection ---a complete line of humorous greeting cards called Spoon Cards.